Georgia is a state located in the southeastern United States. It was established in 1732, the last of the original Thirteen Colonies. Georgia is the 24th most extensive and the 8th most populous of the 50 United States. 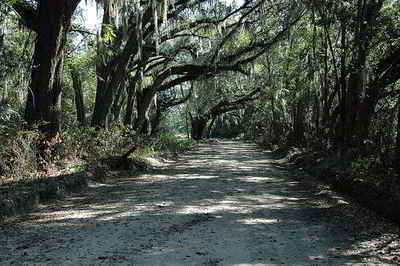 Georgia is bordered on the south by the State of Florida; on the east by the Atlantic Ocean and South Carolina; on the west by Alabama; and on the north by Tennessee and North Carolina. Georgia was named to honor King George II of England. Georgia was named in honor of George II of England. The last of the thirteen original British colonies was named after England's King George II in 1733. The terms of the charter granted by the king specified that the colony to be founded by James Oglethorpe be named after the king and so it was. The nicknames for Georgia these days are The Empire State of the South (originally used in the mid 19th century, but since then has been hotly disputed by Taxes), and the name that appears on license plates, The Peach State (the peach being the official state fruit since 1995). However, Georgia's legislature has not designated an official nickname for the state. Georgia grown peaches are recognized for their superior flavor, texture, appearance and nutritious qualities that promote a healthy, balanced diet. 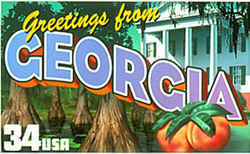 Georgia is known as the "Peach State" because of the growers' reputation for producing the highest quality fruit. The peach became the official state fruit in 1995. Refer to economic leadership, Yankee-land of the South. During 1870's Georgia was being called the The Cracker State. A "cracker" in this context was slang for a low Southern white man, coined in the mid-18th century (although other sources suggest that it may relate to the many teamsters in the state, and be an allusion to the cracking of their whips). Cracker: derogatory term meaning braggarts, as applied to immigrants into Georgia from the mountains of Virginia and North Carolina. Whatever the origin, many Georgians hated the nickname. Georgia has also been known as The Buzzard State (from laws Georgia introduced to protect buzzards). In 1843, Georgia was listed as The Pine State.